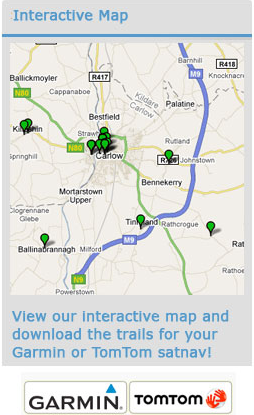 “Carlow – Trails of the Saints” is made up of three separate driving routes which between them cover the entire county of Carlow and feature some 51 ecclesiastical attractions. Some of these are deemed to be of national significance. Named after St. Patrick, who is reputed to have baptised the King of Leinster in north Carlow, this trail takes in the county’s two largest urban settlements of Carlow and Tullow. St Moling, a seventh-century saint, founded the monastery at St. Mullins, beside the River Barrow. This magnificent structure is the highlight on this trail which bears his name. St. Laserian’s Cathedral, in Old Leighlin, makes a perfect start to this trail which meanders through the heart of the county towards Myshall at the foot of the Blackstairs Mountains.